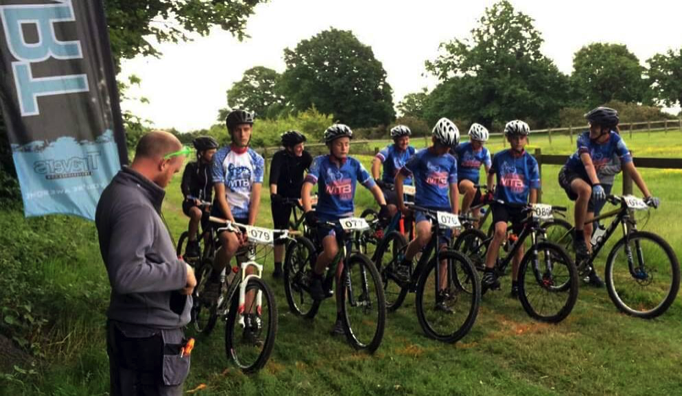 Quite often you’ll find me standing behind tape, somewhere out on a course shouting (encouraging) things at HMTBC youth and adult race team members. I may also be donning a hi-vis to help run bike racing events as part of HMTBC events team. However, I decided that it was time to have a go at racing myself after being inspired by other lady racers and riders. I haven’t got a fancy bike or fancy kit but I do love a challenge and my only aim was to finish! I decided the Travers Essex Summer Evening Series would be an ideal race series to dip my front wheel into, especially at the Potash Woods venue. The field of entrants aren’t too large or intimidating and thankfully there aren’t too many hills to contend with. An ideal beginners race! The day was warm and humid but thankfully the forecast of rain held off. I was quite nervous as I registered but everyone was very encouraging which helped ease my fears. With the reccy lap in the bag, it was time to line up on the grid alongside the other female entrants behind a strong field of men, youths and juvenile boys. And then I was off. The start involved a 400m long grass track which fed us into the woods on to a nice bit of snaking downhill single track (I liked that bit!). Some features such as logs and mini bomb holes I need more experience or skills training for but I’ve learned what things I need to work on in future coaching sessions so did my best. I was happy riding around under my own steam, although sometimes the crack of a twig behind me soon highlighted that the faster men were about to emerge like a freight train from somewhere behind me. All were very polite and made it clear which side they would pass on as I allowed them space to overtake. The younger riders were also fantastic and all had a word of encouragement for me as they passed me by (well done parents, you’ve raised some lovely young men!). Overall, I was very happy that I achieved my goal of just finishing a race. To come 3rd was pleasing and I even got a bit excited seeing my lap times. Thank you to everyone for the support and thanks again to the organisers, marshals and commissaires for giving up your time. I would highly recommend having a go at a MTB race. You might just surprise yourself! This entry was posted in Blog on 20/06/2016 by Hydey.